An inverter is a device that converts Direct Current (DC) into alternating current (AC) of a higher voltage. Inverters are installed as part of a solar system when a client wishes to run AC appliances such as a TV, fridge or lights. 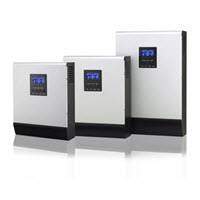 Inverters are used when they are installed in an off grid installation where the appliance needing power to run will draw DC current which is stored in batteries through the inverter which changes the current to AC which the appliance can use.